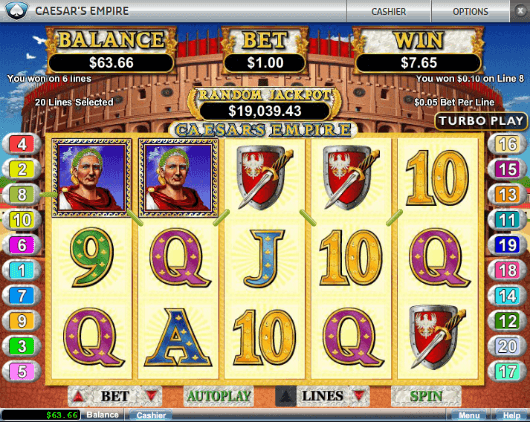 Caesars Empire Slot is a popular 5 reel video machine. At first sight it might appear as any other RTG slot, but it is quite different and offers some nice bonus features, such as Wild multipliers, additional wilds during the Free Spins and more. The theme and the symbols of the game are taken from Julius Caesar quest to Egypt, combined with some classic Roman icons. The Caesar is the wild and substitutes for all other symbols except the scattered. When in a winning combination it triples your prize. If you manage to get more than one wild inline, that can be really rewarding. Other high paying symbols are Cleopatra, the Roman warrior helmet, a Shield and Flowers. Maximum win per spin is 50,000 times your bet per line. The free spins at Caesar’s Empire slot triggers in a different way and not the usual 3 scatters. All you need to do is get 1 Caesar anywhere on the reels and Coliseum on reel 5. I have to say that it seems easy, but in reality it takes some time. The good part is that during the spins, every wild Caesar that appears on the reels awards up to 5 additional spins, so the free spins can go on and on for a very long time. During the free spins all Coliseum symbols turn into Caesars and Cleopatra’s, which are much more rewarding (pay 25x Coliseum). On top of that, all the free spins wins are doubled. Caesar’s Empire also features a progressive jackpot. It is a random jackpot and can trigger in the end of each spin, not related to the symbols on the reels. The jackpot is usually worth somewhere in the 5-figure area. The last time I played it stood on $20,000.